Rapid urbanization has led to sprawl in cities worldwide, reshaping urban geographies and challenging city governments to plan for growing populations. Photo by Omar Bárcena/Flickr. The NYU Stern Urbanization Project has created a number of fascinating time-lapse videos showing urban land use in different cities from the 1800s through to 2000. These videos strikingly depict the well-evidenced trend of urban growth, both in population and land area. By 2050, 66% of the world’s population is expected to live in urban areas. While urbanization can have a number of benefits, if not controlled, it can also lead to costly urban sprawl. In some expanding cities, land use is expected to grow at about double the rate of the population. The Urbanization Project’s visualizations give context to the challenge of urbanization and land use as cities plan for the next century of growth and development. From 1985 to 2000, the population of Accra, Ghana increased by 50% while the city’s land area increased by 153%. It has been argued that this expansion is due to a number of global and local factors, including Ghana’s Structural Adjustment Program, a weak planning framework for growth, and cheap land prices on the city’s periphery. In Nairobi, the average commuter distance increased from 0.8 km in 1970 to 25 km 1998. This is partially the result of low population density, rapidly expanding satellite towns on the city’s edge, and inadequate, expensive housing in the city’s center. In Istanbul, policies have encouraged highway and housing development on the city’s periphery, contributing to sprawl. One of the consequences of this expansion is highly unequal access to transport – as nine out of ten families do not own cars – though the city has improved public transport through its heavily used bus rapid transit (BRT) system. Mexico City is one example of a long history of urban sprawl in Mexican cities due to relaxed regulations and shortsighted policies. National housing policy in the late 1900s encouraged developers to overbuild housing on urban peripheries in an effort grow the Mexican economy. Many people living on the edge of Mexican cities have little or no access to public transport, employment opportunities, education and health services. In Mexico City, sprawling development has increased greenhouse gas (GHG) emissions by up to 70%, and is responsible for USD 2.5 billion (33 billion pesos) annually in lost economic productivity. 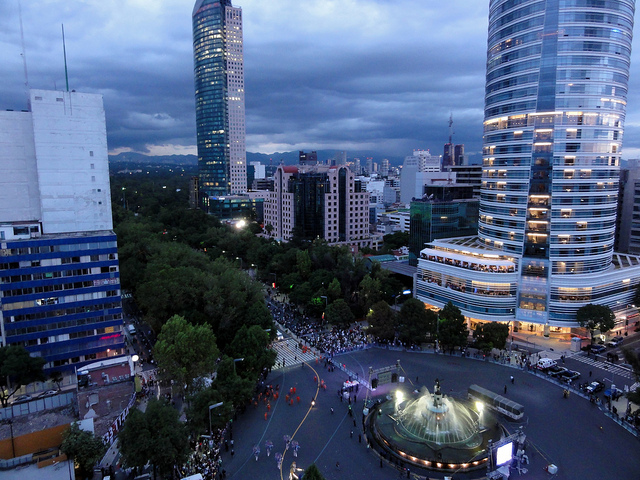 Some signs point towards a shift in development strategy in Mexican cities. For example, President Enrique Peña Nieto announced a strategy for urban development and housing that aims to create more compact and accessible cities. A variety of factors have contributed to sprawl worldwide. At the most basic level, many cities have lacked an adequate vision and strategy to deal with prevailing patterns of rural to urban migration. By highlighting the history of urban expansion, the NYU Stern Urbanization Project aims to encourage cities to plan for the needs of future residents. As cities continue to urbanize, the Urbanization Project stresses the need to “make room for urban expansion” by dedicating land for public works projects before development occurs in urbanizing areas. To form comprehensive plans for sustainable, inclusive development, city leaders must first understand the land use patterns that define their cities today.